It goes without saying that the United States men’s national hockey team entered the Sochi Winter Olympics this year with high expectations. Although this is a young squad, they it is stock full of American- grown talent. This year’s Olympics saw the birth of a new national idol, T.J. Oshie, who carried the Americans to a shootout win over host Russia. 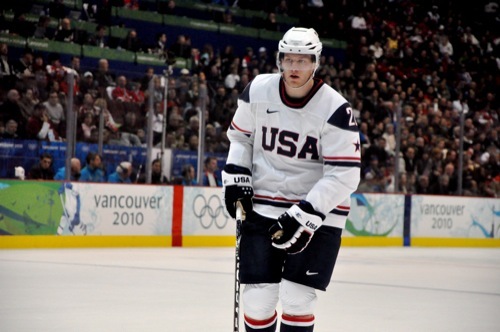 Oshie scored on four of six shootout attempts, and the United States edged out a 3-2 victory. Afterwards, when asked how he felt about being an American hero, he explained that he was not a hero, and that the real heroes “wear camo.” Sadly, that was one of the few bright spots for the Americans in the tournament. The national team played phenomenally in preliminary rounds, with hard-earned wins against Russia and the Czech Republic. However, with revenge on the line against Canada, our neighbors to the north outplayed and dominated in every faucet of the matchup. Credit goes to Stanley Cup-winning goaltender Jonathon Quick for keeping it close. He had 36 saves on 37 shots, while Canadian goaltender Corey Price had only 31 saves. The Canadians played defensively, and shut down a ferocious American offense that includes Oshie, reigning Stanley Cup champion Patrick Kane, and Vancouver Canuck Phil Kessel. If the United States had a hero for this game, it was New York Ranger Ryan Callahan, who kept the outcome in question as he threw his body in front of two power-play shots from Shea Weber. With broken spirits, the U.S. moved on to play Finland in the bronze medal game, but they came out flat and lifeless. Finland shut them out, 5-0. This was a letdown for Americans watching the game, but you have to give credit to Finland for clinching a statement win.